Time For Tea. "Time For Tea" - a wallpaper created by TheCountess for Tim Burton's Alice In Wonderland with Johnny Depp as The Mad Hatter. 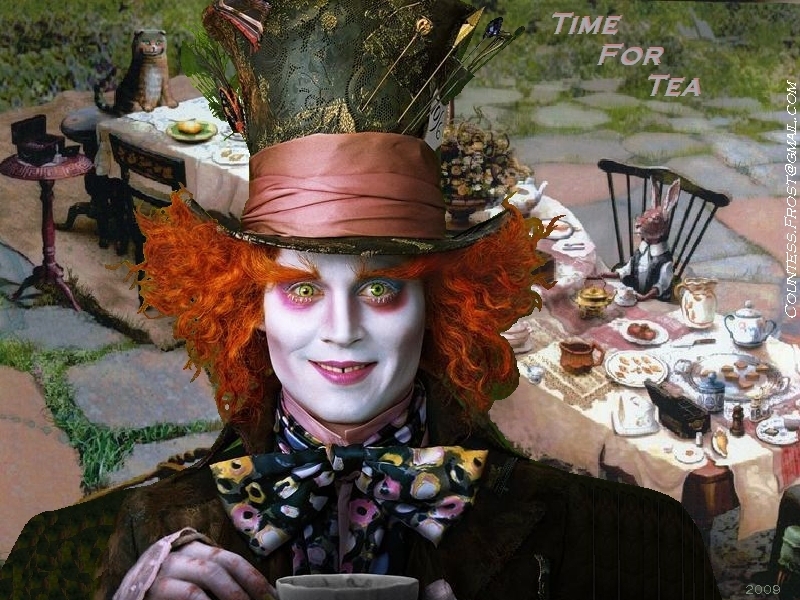 HD Wallpaper and background images in the Alice in Wonderland (2010) club tagged: alice in wonderland tim burton mad hatter johnny depp 2010 fan art wallpaper thecountess. I owe part of it to you for adding an image for me to cut out. I just couldn't look at his eyes while I was working on it. lol! Well done!!! Done any more johnny related stuff? That's the only "Alice In Wonderland" one - at least so far. If you want to check out any of my other Johnny fan art, just go to link. That'll take you to a page where you can select thumbnails of wallpapers, icons, etc. I rlly do lyk this 1, plz don't sayy thank u 2 me!!.. OK, but I'll say you put a smile on my face with your comment. ...and yet another "thank you" is owed to you!